1. Insert repair tool just outside the back of the ball mark. Pull the turf towards the centre of the hole. Repeat this same motion on all sides of the hole. 2. Gently tap the repaired area with you putter. 3. This action stretches undamged turf over the ball mark providing instant recovery. 1. DO NOT pry up the centre of the depression with repair tool as it exposes the soil and will delay the healing process. 2. DO NOT insert repair tool and twist it. This only breaks more turf loose. 3. 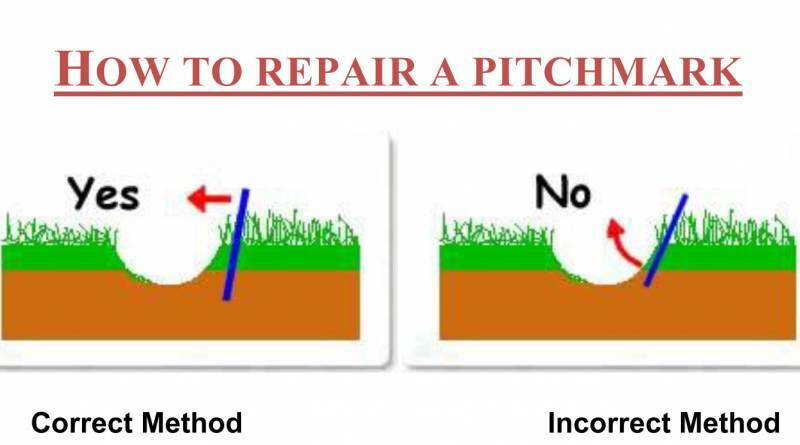 A Pitch Mark takes only 15-30 seconds to fix correctly, a Pitch Mark in-correctly reapired takes over 3 weeks to heal. 1. If your pitch mark has actually displaced a piece of turf, do not replace it. Just work around the edges with your repair tool as normal. Any replaced turf will simply die, delaying the healing process. 2. Pushing the tines of your repair tool under the indented area and pushing up only damages the root system. 3. You should not only always repair your pitch marks, but, time permitting, you should repair any other ball marks you see, too. 4. Pitch mark repair tools available from our pro shop. Question: - My ball lies just short of the green. There is a pitch mark, just off the green, between my ball and the hole. Can I repair the pitch mark or can I get another player to repair it? A player must not improve or allow to be improved his line of play by eliminating irregularities of surface. Question: - My ball lies just short of the green. There is a pitch mark on the green, between my ball and the hole. Can I repair the pitch mark? A player may repair on old hole plug or damage caused to the putting green caused by the impact of a ball whether or not the player's ball lies on the putting green. (Any other damage to the putting green must not be repaired if it might assist the player in his subsequence play of the hole).